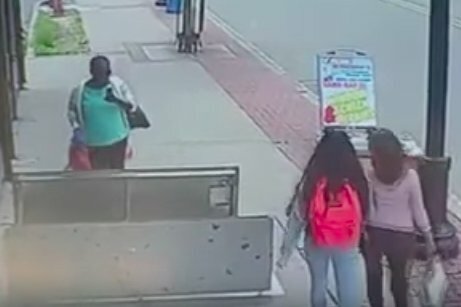 A woman is shown just before she fell into an open cellar door while appearing to check her cellphone in Plainfield, N.J. on Thursday. She was hospitalized with serious but not life-threatening injuries. Surveillance footage captured a woman's alarming fall into an open cellar door this week while she appeared to be walking and checking her cellphone at the same time. The 67-year-old woman was seriously injured when she fell headfirst Thursday in Plainfield, New Jersey. In the video, she can be seen walking on a sidewalk toward the open basement, checking her phone right as she stumbled over one of the open, upright doors and falling six feet into the cellar. Two passersby are shown opening their mouths in horror as she fell. The woman's son told CBS2 in New York City that his mother is legally blind and diabetic. "She regularly schedules her meals and checks her sugar," said the son, who did not give his name. "As far as I was told, when she was walking down the street, she felt a little nauseous in a sense, and looked at her phone to see what time it was." He also told the station that his mother has trouble seeing blended colors, and that he wished workers put cones or a sign in place to alert passerby to the open doors. Police said the doors were open because of repairs to gas lines in the area, according to the report. EMS personnel took the woman to a local hospital with serious but not life-threatening injuries, and she is stable, police said.